Needles Townhomes are contemporary mountain-styled condos made for comfort and enjoyment with open living area, private decks and easy access to and from area activities. 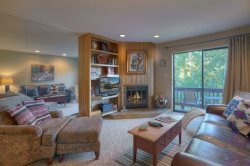 This three bedroom, three bath condo provides comfort and is in a great location for both summer and winter activities. Bedroom configuration includes master bedroom on upper level with king bed and private full bath with dual vanities and jetted tub. Also on the upper level is bedroom suite 2, with queen bed and private, 3/4 bath (walk-in shower). On the ground-level bedroom 3 includes two sets of bunk beds (four twins, total), with 3rd bath in hallway. Purgatory Resort is only 5 minutes away for skiing, ski biking and snowboarding in the winter. In summer enjoy mountain biking, hiking and the all Purgatory activities including Music in the Mountain music festival. Many miles of hiking trails are just minutes away and the Elbert Creek Trail is located immediately across Highway 550 from these Townhomes. Easy access to the San Jan scenic byway one of the most beautiful drives in Colorado. Enjoy visiting to Silverton, Ouray and Telluride. A great location to enjoy the Four Corners Area any time of year. What a great location! Five minute drive from Purgatory Resort and about 27 minutes from downtown Durango, Colorado. This home is on the San Juan Scenic Skyway, which is an incredibly scenic driving loop that connects Durango, Mancos, Mesa Verde National Park, Telluride, Ouray, Silverton and Purgatory, as well as many fantastic trails for hiking, mountain biking and other Rocky Mountain adventures. A great location to enjoy the Four Corners Area any time of year. Mountain views of the Hermosa Cliffs and Castle Rock to the west can be seen from the front entrance, upper balcony, and many vantage points around the home. Walk from this home to the start of the Elbert Creek Trail immediately across the highway for a hike that leads to the top of Castle Rock with impressive views of the valley below. Purgatory Resort, previously Durango Mountain Resort, is under new ownership, with the addition of new ski lift, and other guest-friendly improvements. Enjoy skiing, snowboarding, ski biking, sledding and more in the winter, mountain biking, hiking and the all Purgatory activities including Music in the Mountains music festival in the summer months. Motorcycle enthusiasts have a 100%, completely paved riding experience that includes a large, paved parking area suitable for + bike trailers, and this location is on the paved San Juan Scenic Skyway, which offers a popular scenic drive for motorists of all kinds. Serious road cyclists with find the paved highway north to Silverton or south to Durango to be scenic and challenging routes. Mountain bikers have many choices of trails that allow bikes, and hikers are minutes from a vast array of high mountain hikes. Horseback rides and more await summer visitors, and this town home is a very convenient location to winter activities including skiing and snow boarding at Purgatory, snowmobile tours in the high country, cross country skiing, horse drawn sleigh rides and more. This home is surrounded by tall aspen trees making a most spectacular site for fantastic views during the golden fall color of autumn. We are always on call for guest emergencies and offer concierge services by request. On-site Manager for items requiring immediate attention. Private entrance. Full access to entire townhome, free outdoor parking lot, community hot tub, lawn with picnic table lawn chairs and grill. This town home has undergone recent remodel and renovations. The kitchen is updated with contemporary style and appliances. Purgatory Resort, previously Durango Mountain Resort, is under new ownership, with the addition of new ski lift, and other guest-friendly improvements. This townhome is just a five minute drive to Purgatory Resort on paved, state highway. Our trip was almost derailed from an unexpected blizzard, and Marie was so nice to allow us to check in a day late and even offered to let us stay a day longer. This is an amazing condo! It's 5 minutes from Purgatory, but that's not the best part. It accommodated 6 adults and 1 child easily, it had everything we needed and more. Our trip was almost derailed from an unexpected blizzard, and Marie was so nice to allow us to check in a day late and even offered to let us stay a day longer. We will definitely be back! Our group is already talking about coming back in the Spring and again next year. Thanks, Marie!